On Friday, July 13, 2018, the Oregon Heritage Tree Program dedicated the Yang Madrone as a new heritage tree in Corvallis, Oregon. The large Pacific Madrone tree overlooking the Yang house was planted by Hoya Yang to complement the house his wife, Edith Yang, designed. 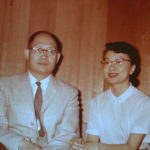 In 1954, Edith became the first female minority architect licensed in Oregon. She designed many buildings in the area and started the Corvallis street tree program. Hoya was a prominent food scientist who was influential in the beginnings of the Oregon wine industry and the development of the maraschino cherry. 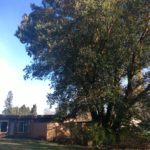 The Yang Madrone was designated a Corvallis Benton County Heritage Tree in 2016 and was accepted into the state heritage tree program this year. The tree is 23 feet in circumference, 68 feet high, with a crown spread of about 75 feet. It is said by the Corvallis City Forester to be the largest madrone in Corvallis, and the second-largest madrone in Benton County; the largest being in an inaccessible rural area. Today, the population of Pacific Madrones is dwindling due to diseases and urbanization. Madrones are not usually found in urban settings like the Yang Madrone, because they are extremely difficult to transplant, and often do not withstand disturbance of the soil around their roots. The tree is located 20 feet from the public sidewalk at 1020 30th St., Corvallis, Oregon.